On Friday, September 14, Hurricane Florence hit land with our city of Wilmington, NC at the center of the storm. Though it had slowed from a category four hurricane to a category one before landfall, it hit the city head on, unique for a storm in the middle of the coast. At 5 AM on Friday the power of the storm was awesome, ripping up and snapping trees and knocking out power lines — it was quite a sound! The storm was slow moving, dropping 24 inches (60 centimeters) of rain over about 3 days. We had already had historic rainfall a few weeks before, leaving the ground saturated and ready for maximum damage. 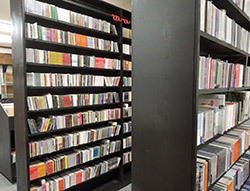 • Buy any new CD, LP, DVD, Cassette or BOOK and take 10% off. • Buy 3 or more new items, take 15% off! Click here to Shop at Squidco! This sale ends Sunday, September 23, 2018 at 23:59 EST (GMT-4). Prices shown are discounted price. While quantities last, sold out items will disappear from the store.. Customers must place orders using our shopping cart to receive discounted prices. Sale items are not eligible for Squidco Reward Points. Next week's mailing list will be larger than usual as we were in the midst of preparing last week's mailing list when storm preparation started.